Experience one of the newly opened trekking routes in Nepal – Ruby Valley Trek with its unique biodiversity, cultural and traditional aspects with a wide rare and adorable scenic view of the Himalayas of Nepal within Ganesh Himal Region. Mt. Ganesh I, locally called Yangra peak (7422m), Ganesh II (7118m), Lapsang Karbo (7043m), Pabil (7,104m), Mt. Manaslu (8163m) and Langtang, are the famous Himalayan peaks visible from Ganesh Himal Ruby Valley Trek. Ruby Valley Trek is a recently introduce trekking trail of Nepal which is regarded as the hidden trail located in the central region of Nepal. Ruby Valley is named after the precious stone – Ruby, as because this valley is considered as the home of ruby stones. Trekking to this outstanding place delivers with lots of opulent features to lure and make a beautiful moment within Ruby Valley. Exploring around this beautiful valley will create distinctly memorable moments. Ganesh Himal Region is opulent in biodiversity as it touches both Langtang National Park and Manaslu Conservation Area, so the trekking within Ruby Valley provides the golden chance to witness out the rich nature in reality. The Ruby Valley offers with distinct variety such as pine forest, rugged rocks, rhododendron forest, oaks, and many herbaceous plants along snow-capped mountains, grassy downs and meadows spread with wild primulas. The vivid collection of rare species of flora and fauna makes the region fantastic as during Ruby Valley Trek one’s can get opportunities to encounter with such endangered species. The trek towards Ruby Valley begins with a scenic drive from Kathmandu to Syprubesi. And the trek continues next day passing through Gatlang (2238m) and Somdang (3500m) to one of the pass – Pangsang Pass that delivers with the ample picturesque view of mesmerizing snow-capped mountains. Along with that, passing through the beautifully set up villages with their unique and extra way of living, culture, and tradition equally contribute a myriad range of facts to make the journey in Ruby Valley incredible. The popular Black and White lake is known as Kalo Seto Kunda is another attractive gem of this valley trekking route as from this place the majestic views of Ganesh Himal, Paldor Himal and many others peak can be observed. Along with this, Ganesh Himal Base Camp and Kalo Seto Kunda are also present to deliver their best panoramic view of the majestic mountain. Ruby Valley trek is favorable for those who are looking for trekking in Himalayas of Nepal individually or in a group. The box-up package for 18 days for Ruby Valley Trek is incredible and as per one's interest and time frame, the trek can be customized. The perfect seasons to get enrolled in Ruby Valley Trek are Autumn (September to November) and Spring (March to May) and nevertheless January, February and December are also favorable months to explore in Ganesh Himal Region. This is a great opportunity to participate in this trekking route to observe all sorts of experience within a package. 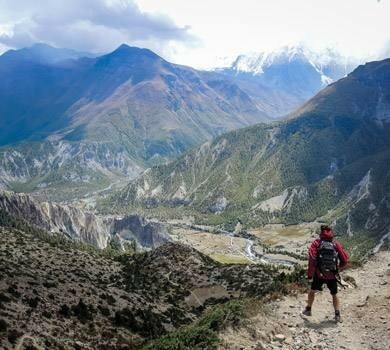 Ruby Valley Trek is also regarded as off-beaten-trek of Nepal and this valley trek is basically focused as camping trek but also normally available for home-stays. The team of Massif Holidays will be present there to make the trek towards Ruby Valley outstanding and memorable. Stunning view of Manaslu, Ganesh Himal, Langtang and Massif Annapurna. Observing the lifestyle of different ethnic groups. 17 Breakfast, 14 Lunch and 15 Dinner. Day 03: Drive from Kathmandu to Syprubesi. About 7-8 hours. Overnight stay at Guesthouse. 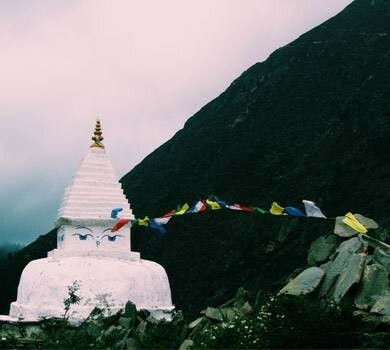 Day 04: Trek to Gatlang (2238m.) via Goljung. Around 5-6 hours. Overnight stay at Guesthouse. Day 05: Trek to Somdang (3500m). Around 5 hours. Overnight stay at Guesthouse. Day 06: Trek to Pangsang Bhanjyang (3850m). About 5-6 hours. Overnight stay at Camp Site or Homestay. Day 07: Trek to Chalise (1674m). About 6-7 hours. Overnight stay at Camp Site or Homestay. Day 08: Trek to Hindung (2048m). About 5 hours. Overnight stay at Camp Site or Homestay. Day 09: Trek to Rajgang Kharka (3337m). About 5-6 hours. Overnight stay at Camp Site or Homestay. Day 10: Trek to Kalo Seto Kunda (Black and White Lake) (4341m). Around 5-6 hours. Overnight stay at Tented Camp. Day 11: Rest day at Kalo Seto Kunda. Explore around the Base Camp. Overnight stay at Tented Camp. Day 12: Trek to Rajgang Kharka (3337m). About 5-6 hours. Overnight stay at Camp Site or Homestay. Day 13: Trek to Lapa village (1750m). About 5-6 hours. Overnight stay at Camp Site or Homestay. Day 14: Trek to Manyang Bhanjyang (2934m). About 5 hours. Overnight stay at Camp Site or Homestay. Day 15: Trek to Majhgaun (2200m). About 5-6 hours. Overnight stay at Camp Site or Homestay. Day 16: Trek to Budathum (1120m). About 5 hours. Overnight stay at Camp Site or Homestay. Day 17: Trek to Arughat Bazaar (500m). About 2 hours then drive back to Kathmandu. Overnight stay at Hotel. All your standard Meals during the trek prepared by our local staff (Breakfast, Lunch, and Dinner). The required number of local staff and porters to carry your luggage during the trek (one porter for every two people). All land transportation wherever applicable. Entrance fee at all monuments during the tour in Kathmandu. Nepal entry visa fee that can be issued on your arrival at Tribhuwan International Airport. All beverage items, hot shower, battery charge & laundry services. The listed optional facilities for the trekking within Nepal are not included in the travel cost. As per guest choice and demand for extra facilities or services some amount will be added on the trekking package cost. You can include the other extra facilities and services in your trekking package with consulting to the crew member of Massif Holidays. Natural calamities, etc. that are beyond the control can hamper one’s planned trip. During these kinds of issues, the team of Massif Holidays will be getting through the possible solution that can help to get back in the trip.